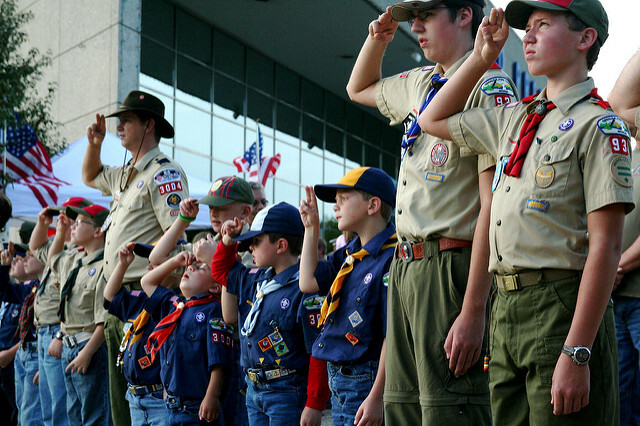 The Boy Scouts of America are considering filing for Chapter 11 bankruptcy. The Scout’s financial issues come from insurance companies’ refusal to pay for the organization’s defense of sexual abuse claims. The Scouts were sued by about a dozen men who claim they were sexually abused as boys by an infamous scoutmaster. The BSA finds itself in the same situation as the Roman Catholic Church. About 20 dioceses and religious groups have sought Chapter 11 protection while they negotiate settlements with thousands of victims. Like the Catholic Church, the BSA is accused of being negligent in removing local leaders accused of sexual harassment away from minors. In the 1970s, disgraced Scoutmaster Thomas Hacker was banned from the organization for sexually abused minors. However, Hacker was able to resume his activities by becoming the leader of Troop 1600 at the St. Louis de Montfort Church in suburban Chicago. Hacker was convicted in 1989 of five counts of aggravated criminal assault and sentenced to two 50-year prison terms. Hacker died in prison while serving his sentence. The BSA claims it now runs criminal background checks and maintains a database to ensure that men like Hacker cannot rejoin the organization. Most organizations carry commercial liability insurance to protect themselves against lawsuits. Any organization, whether they are businesses or non-profits, face potential lawsuits. Given the number of daily interactions between employees, customers, and contractors, the risk that an organization may be sued is rather high. Insurance companies understand these risks and offer generous commercial liability (usually $1 million or greater) to defend against potential negligence claims. However, both the law and insurers treat intentional acts with greater severity than negligent acts. This is sensible given the degree of control that people have over intentional acts over negligent acts. Auto accidents, slip and falls, and other accidents caused by careless acts are preventable, but they are often also one time occurrences. The consequences can be devastating for the victims, but no one intends for an accident to occur. In contrast, intentional acts are not only carried out by individuals with plans and purposes, they may also occur repeatedly unless those individuals are punished or removed from the organization. There is no such thing as an accidental battery or sexual abuse claim. To deter individuals from engaging in harmful intentional acts, the law punishes intentional acts more severally than negligent acts. The harmful intentional acts are often made illegal by criminal law while civil law levies punitive damages and other sanctions on persons who ignored, permitted, or even encourage criminal acts to be carried out in their name. Since intentional acts can lead to greater judgment awards against the defendant, insurance companies may outright deny coverage for intentional torts. Indeed, punitive damages for the intentional acts of employees may exceed the coverage amounts given by most insurance policies. Even after the U.S. Supreme Court ruled that punitive damages cannot exceed a 10:1 ratio to general damages, the judgment awards can still exceed $1 million. The general damages for serious intentional acts can be very high, which in turn will lead to greater punitive damages, even with the 10:1 ratio in place. Eventually though, the weight of all those judgments without insurance coverage will take its toll. While it may seem unfair that organizations that generally benefit the community may face bankruptcy, both the BSA and the Catholic Church failed to live up to their responsibilities. The communities and the organizations themselves held institutions like BSA and the Catholic Church to the highest moral standards and they failed to protect the most vulnerable among us. The purpose of sexual abuse laws generally and of punitive damages specifically is to punish and deter this kind of behavior. Financial hardships are nothing compared to the pain and suffering of children abused by sexual predators. While courts and penalties may be intended to punish wrongdoers and those who enable them, bankruptcy serves a different purpose. The goal of bankruptcy is to provide a fresh start to debtors, not to punish those held accountable. To be sure, civil judgments for fraud or injuries to others cannot be discharged through bankruptcy. If Thomas Hacker wanted to discharge civil judgments through bankruptcy, he’d be completely out of luck. The BSA and Catholic Church would face better odds, though a bankruptcy court could rule that those judgments are not dischargeable. For instance, the organizations’ vicarious liability for the sexual abuse may be considered a civil judgment for “injuries to others” and/or that concealment of those abuses constitutes fraud. However, Chapter 11 bankruptcies are not built for discharge (though they may include discharge as part of the overall plan). Instead, Chapter 11 is for businesses and organizations to reorganize themselves to become more efficient. For the BSA and the Catholic Church, bankruptcy will likely mean restructuring how their organizations are run while the civil judgments against them will likely still need to be repaid. Did Donald Trump’s Campaign Rip Off A Florida Girl Group? « When Do We Get a Jury Trial in Civil Court?